1) Union Station (most right station, on the 'red line') - This is where I arrived Sunday. It's actually the Metro and Amtrak station. 2) Woodley Park (most northern station, on the 'red line') - This is where my hotel is. 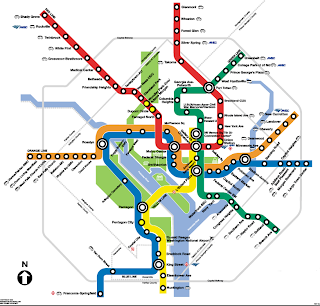 3) Pentagon City (most southern station, on the 'blue' and 'yellow' lines) - This is where I went Monday night. "Pentagon City Fashion Mall" is right on top of it. Also had "Pentagon City Centre". 4) Dupont Circle (one stop south of "Woodley Park", on the 'red' line) - This is where I was last night We actually walked there for sushi, and then rode the Metro back to the hotel. I'd really like to figure out how to mark things in Google Maps and may yet. But, I thought this would be interesting to the folks back home. It's 8 min to 2 in the morning. I think I need to get to bed. 'Night!